Straight Up Now-Baby Got Back...and Wants to Lose it, Lose it. Straight Up Now-Baby Got Back…and Wants to Lose it, Lose it. 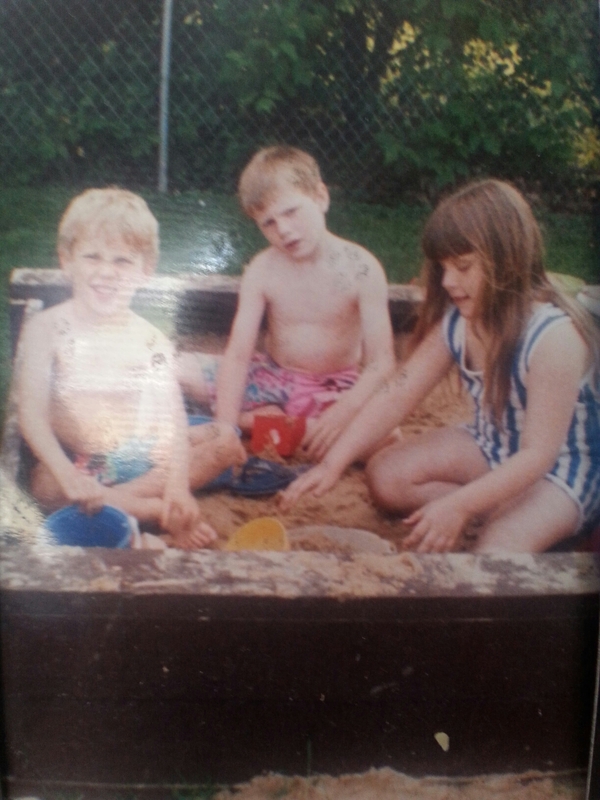 My baby brother and cousin rockin’ out in the sandbox. I have two songs for you. Because I’m a terrible decision maker. And I’m doing something else this month for funsies. The first song is one my cousin (the adorbs blonde above on the left) and I used to dance around my mother’s living room listening to…on CASSETTE TAPE. Most of the music I listened to as a kid was from my parents’ fave radio stations, but we loooved the Paula Abdul. 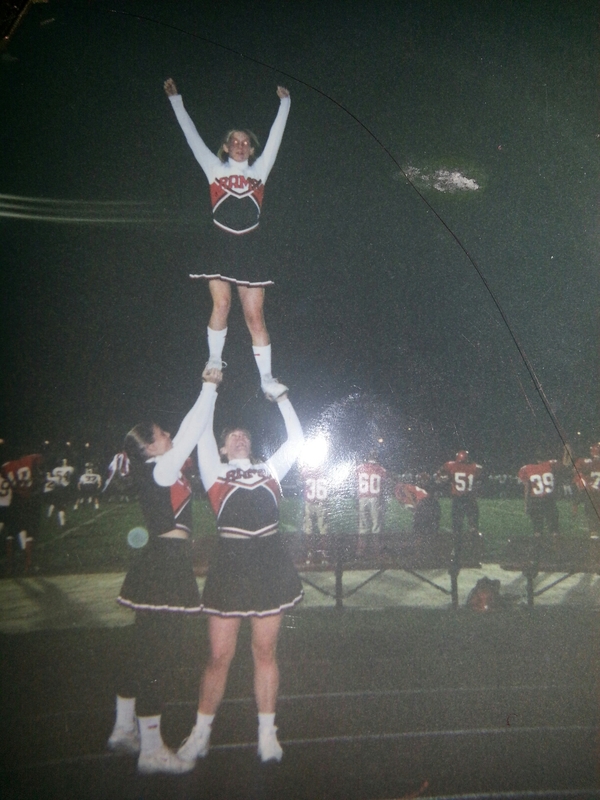 The second song is from my high school cheerleading days. Not quite childhood, but pretty darn close. Yes. That. Our senior year, this song was part of our competition routine. And yours truly was the girl who stood up valley-girl-style to say, “OH. MY. GOD.” It was awesome. In this picture, I was doing a single extension with the support of a spotter. It was my proudest cheercomplishment. As I checked out this pic, I thought about how I used to think I was fat, because I was bigger than the other girls…and what I wouldn’t give to have those legs again! Which leads me to the The Pocketful of Quirky Grace DietBet. 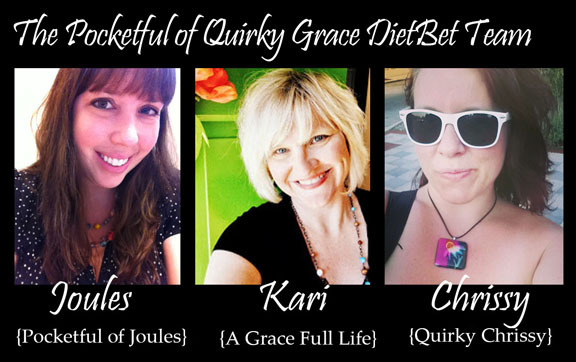 I’m joing up with two of my bloggy friends, Joules of Pockful of Joules and and Kari of A Graceful Life, to lose a few pounds. And you can join us too! I’ve done the Weight Watchers thing since, well, high school…and it has worked and it has not worked…So I’m doing this with my own diet and exercise and financial accountability, but you can use whatever method works for you. The goal is to lose 4% of my body weight in 4 weeks. With DietBet, everyone can win. Join our DietBet now! The DietBet’s official start date is Tuesday, May 6, 2014. All participants will need to weigh-in on May 4th or May 5th. The cost to participate is $20. The Bet is to lose 4% of your body weight in 4 weeks. The official end date is June 2, 2014. You can make your weight private so that only YOU see it. Your pictures can also be private (your full body shot and scale shot). We can all support each other on the DietBet site to stay motivated. At the end of the bet, the total amount of money in the pot is split between the winners (after they take their fee out). If we ALL win, DietBet will not take their fee and we will all get our $20 back. So wish me luck. And get excited for the next 24 days of musically themed posts! Anyone who says they don’t like Baby Got Back is a liar. I can’t either. Not even gonna try. Loved The Paula. Loved The Sir Mix A lot too!. And that single extension… Love. YAY To you three! I cannot wait to hear how you do. I would join, but I am buying a house, a super fixer-upper so I will be on the stress diet. …and thanks to having a toddler, I can only focus on him and one other thing at a time..
Well, the stress diet will do one of two things: Starve you or feed you. Either way, you win! (starve=skinny, feed=yummy). You speak music and that is my primary language. You will ROCK this whole bet thing. If we don’t. lets go out for ice cream after. That sounds like a plan! !